The Global Precipitation Measurement mission or GPM core satellite provided a look at the heavy rainfall occurring in Typhoon Talim in the northwestern Pacific Ocean. The GPM core observatory satellite scanned the western side of Typhoon Talim on September 13, 2017 at 0216 UTC (Sept. 12 at 10:16 p.m. EDT). GPM's Microwave Imager (GMI) instrument collected data showing that Talim was a large typhoon that was producing heavy precipitation. GMI showed that intense bands of storms wrapping around the center of the typhoon were dropping rain at a rate of over 76 mm/hour. GPM's Dual-Frequency Precipitation Radar (DPR) only scanned the western and southwestern side of the typhoon. DPR found that a few powerful storms in a feeder band well south of the storm's center were dropping rain at a rate of over 120 mm/hour. GPM is a joint mission between NASA and the Japanese space agency JAXA. 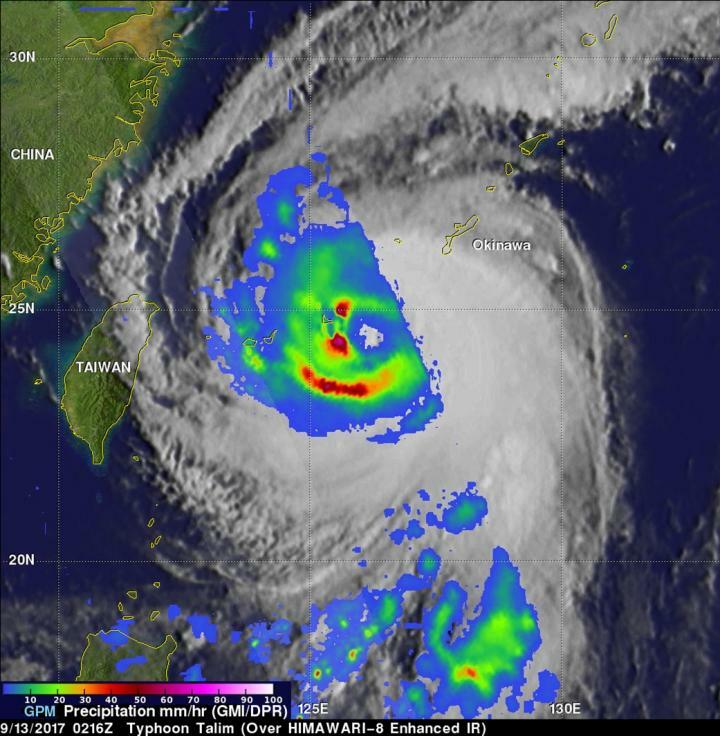 At 5 a.m. EDT (0900 UTC) on Sept. 13, Typhoon Talim had maximum sustained winds near 75 knots (86.3 mph/139 kph). It was located near 25.0 degrees north latitude and 125.7 degrees east longitude. That's about 145 miles southwest of Kadena Air Base, Okinawa Island, Japan. Talim was moving to the northwest at 8 knots (9.2 mph/14.8 kph). The Joint Typhoon Warning Center (JTWC) predicts that Typhoon Talim will intensify as it moves to the west-northwest. Environmental conditions such as low vertical wind shear and warm sea surface temperatures are favorable for Talim's intensification. Talim's winds are expected to increase to a peak of 115 knots as it re-curves toward the Japanese island of Kyushu.